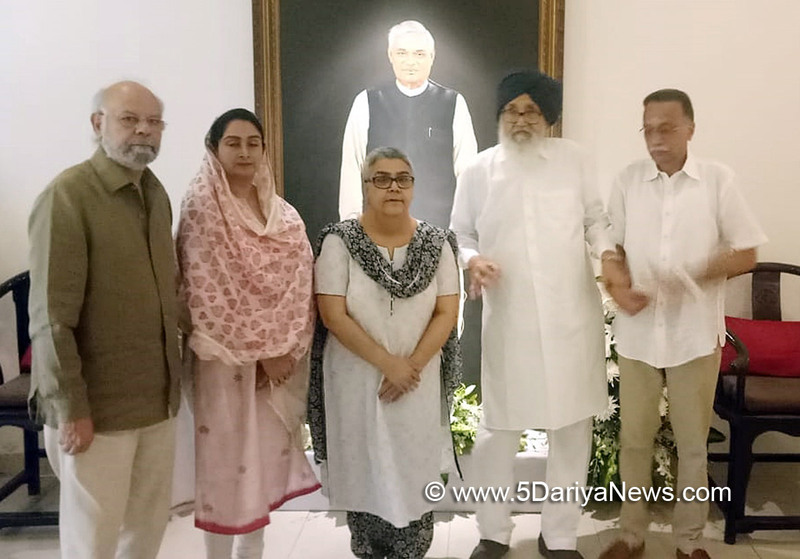 Five times chief minister and Shiromani Akali Dal (SAD) patron Parkash Singh Badal today visited the residence of former Prime Minister Atal Behari Vajpayee and expressed his deep condolences with the late PM’s family members and described the late leader as a friend of Punjabi and Punjabis.While interacting with the late PM’s family members, including daughter Namita Kaul Bhattacharya, the SAD patron said Punjabis would never forget the generosity show to the State by the late PM. Giving two examples he said during the run up to the 350th anniversary of the birth of the Khalsa Vajpayee not only asked the State what it wanted but also allocated Rs 100 crore to celebrate the occasion in a befitting manner. Mr Badal said similarly when he approached the late PM and told him how repeated Congress governments had discriminated against the State and made out a case for allocation of a refinery to Punjab, Vajpayee took a decision on this request within five days and allocated Punjab the Rs 16,000 crore Bathinda refinery project.Mr Badal also spoke about the late PM’s secular nature during the course of the meeting detailing how Mr Vajpayee had opposed the massacre of Sikhs in Delhi and even paid for this by losing the subsequent election from Gwalior.The former CM, who is still recovering from viral due to which he could not participate in the last rites of Mr Vajpayee, also recalled how the late PM had implicit faith in the SAD and vice versa. He said the former PM would often say that if there was one alliance partner whose support he could bank upon implicitly it was the SAD. He also recalled how the former PM had displayed nerves of steel by going ahead with the Pokharan nuclear test besides talking about his sterling leadership qualities during the Kargil battle.Mr Badal was accompanied by union minister Harsimrat Kaur Badal and Rajya Sabha member Shri Naresh Gujral.